March 16, 2017, Nuremberg, Germany –At Embedded World 2017 today, Advantech (2395.TW), along with AIMobile, ArcherMind, Canonical, Lineo, Retronix, RTSoft, Timesys, ThunderSoft and Witekio, announced that they are forming the Embedded Linux & Android Alliance (ELAA). This industry alliance is committed to driving standardized board adoption of an open and unified architecture for embedded Linux and Android OS for industrial embedded and IoT application. By joining the ELAA, participants help advance industrial standards and the open-source community, which will empower Linux and Android adoption in embedded and industrial IoT applications. According to an IHS report, demand for a large product mix from businesses in different industries will have a substantial impact on the embedded board market in the IoT era. Embedded Linux and Android solutions are anticipated to transform key growth markets with highly diversified IoT and industrial applications. However, with the lack of standards on the software and hardware side and a weak eco-system in the embedded market for Linux or Android based solution, means that the Embedded Linux & Android Alliance (ELAA) is well equipped to drive the standardized board adoption of an open and unified architecture for embedded Linux and Android OS for industrial embedded application. ELAA unified hardware & BSP members will provide ELAA Unified Development Platform with hardware products and a BSP that will form their core value offering. Other members will provide their own carrier boards and peripherals, as well as tailor-made hardware and software services on top of ELAA Unified Development Platform for Linux or Android differentiation. The eco-system values that ELAA members want to provide to customers are: faster time-to-market, minimal development risk, extensive software offerings, and compatible peripheral integration. Through co-business development and cross marketing opportunities with the ELAA eco-system, the marketplace will expand and prosper. 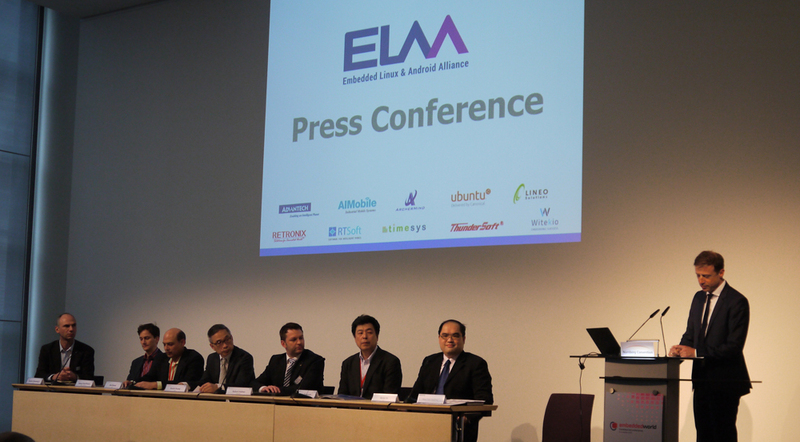 During Embedded World, ELAA willunveil theirNXP platforms, and plan to launchdifferent SoCs solutions in 2H17. Furthermore, ELAA is expected to offer more software solutions along with an announcement of more additional partners joining. Plus, a co-marketing campaign will be held in Taiwan, Japan and China following the Embedded World show. Embedded Linux and Android are estimated to grow at a rapid rate. More and more diverse applications will be applied in gaming, medical, in vehicle, M2M and IoT. With support from ELAA, we believe an open hardware and software architecture with strong eco-system can deliver extra value to the next generation of embedded and industrial IoT applications. From left to right: Witekio CEO Yannick Chammings, Canonical Head of Marketing Thibaut Rouffineau,Timesys CEO Atul Bansal, Retronix CEO Dustin Huang, RTSoft VP Hubert Hafner, Lineo President & CEO Akira Kobayashi,Advantech AVPAaron Su, Advantech AVP Hans-Peter Nuedling. Founded in 1983, Advantech is a leader in providing trusted, innovative products, services, and solutions. Advantech offers comprehensive system integration, hardware,software, customer-centric design services, embedded systems, automation products, and global logistics support. We cooperate closely with our partners to help provide complete solutions for a wide array of applications across a diverserange of industries. Our mission is to enable an intelligent planet with Automation and Embedded Computing products and solutions that empower the development of smarter working and living. With Advantech, there is no limit to the applications and innovationsour products make possible. (Corporate Website: www.advantech.com).